As an experienced 3D animator, my first thoughts about any animation application are mostly about usability: How quickly can I create something, how good will it look, and what makes this 3D application better or different than others? Kinemac 1.8.3 makes creating 3D animation fast and fun. Most computers today can handle the average 3D animation project right out of the box. But there are times when you really need the combined performance of both a great computer and great software. When a client is waiting and you’re under a deadline, the critical questions are: Will your software perform and will the quality of the output meet your standards? Kinemac holds up its end of the bargain by delivering what it has promised. When firing up Kinemac for the first time I didn’t find the interface too overwhelming, or too impressive either. It reminded me of Apple’s Pages or a simplified version of Apple’s Motion work environment. That is a positive first impression. Upon startup, the Kinemac interface has a familiar Mac-like look and feel. While it’s not a full 3D modeling application that allows full edge control, weight maps, and complex modeling tools, Kinemac does let users build from basic primitives such as tubes, boxes, discs, pies, and more, and generate 3D text and animated charts. For many digital artists, this is often all that’s needed. You can do more by importing images, movies, and 3D objects from other applications in OBJ and 3DS formats. Kinemac allows you to apply surfaces containing reflections, color, transparency, and other variations. A bonus is that you see your results in real time. Let’s say you’re creating a presentation for a meeting and need to spice it up a bit. You can use Kinemac to create scrolling text, both in 2D and 3D, for a dynamic impact. Or better, how about a 3D animated graph or pie chart? Creating such elements is quick and easy with Kinemac. 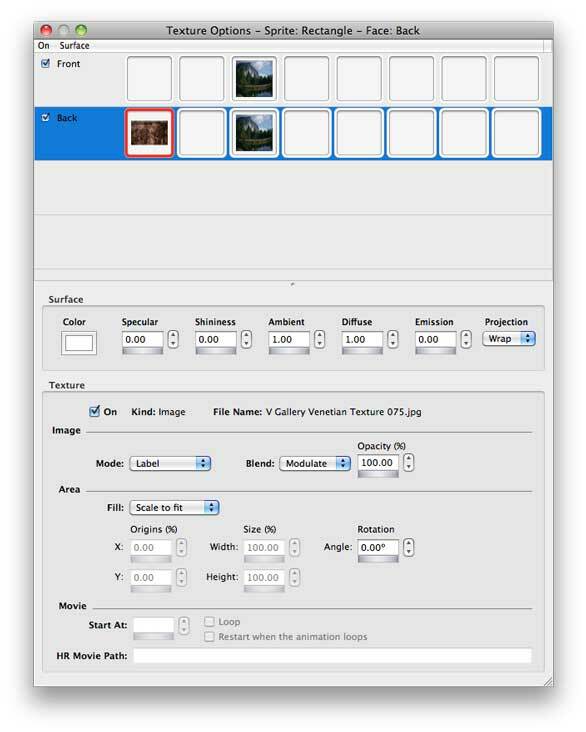 Kinemac’s drag-and-drop interface is convenient and enhances this handy program's ease of use. 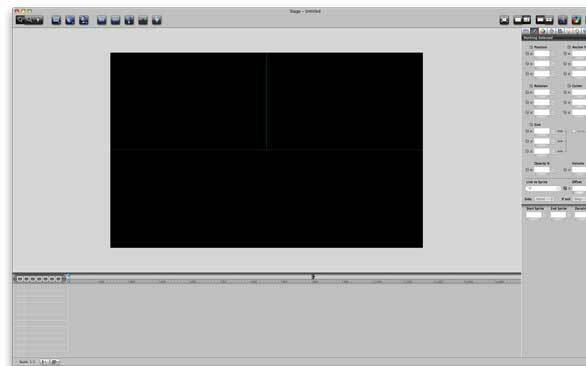 Drag your images, text, movies, and songs onto the Kinemac stage to include them in your animation. For example, first add a cube to the workspace. Then, a single mouse click while holding the Command key quickly allows you to reshape that cube into a DVD case. Then drag and drop an image from the inspector panel to the cube to automatically map and align with it. You can do the same thing to create a ground plane. By opening the Texture Options panel, you can quite easily change the color, shine, diffuse values, and more. Once a texture is added, you can edit the properties in the Texture Options panel. Once you have your models in place, your surfaces applied, and some lighting set, you can start to animate your subject. Kinemac gives you greater control over motion with its sprite-based timeline. This sprite console allows you to synchronize animations with other objects as well as with soundtracks. You can quickly build a motion curve and apply an object to it. Or you can keyframe size and position elements. Press the spacebar, and you can watch the animation play without waiting for it to render. The ability to bring sound into an animation enables you to not only better time your animations, but also better control motion. This is a real advantage that Kinemac has over other, more popular 3D applications such as Luxology’s modo or NewTek’s LightWave 3D. Individual movements can be controlled with more accuracy to enhance motion within your animation. Using a control system based on Bezier curves, you can control position, rotation, size, speed, and acceleration of any object. Once everything is set, export your project to a movie (or a single frame) to whatever codec you have on your system, such as H.264, Avid, Final Cut Pro, or FLV. Kinemac 1.8.3 is a reasonably priced but powerful 3D-creation tool from which any digital artist can benefit. Whether you’re a hobbyist or a professional 3D content creator, this program is definitely worth checking out. Creates 3D animation in real time. Solid importing and exporting capabilities. Animations can be combined with audio.